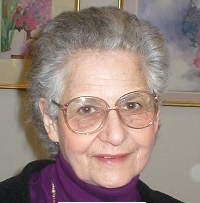 Marion Walter is a German born Professor Emerita of Mathematics at the University of Oregon in Eugene, Oregon. Her mathematical interests revolve around problem posing and informal geometry. Professor Walter was born in Germany in 1928. In 1939, her parents sent Marion and her sister to England on the Kinder Transport, a rescue effort that permitted Jewish children to enter Great Britain, and there she was sent to an English boarding school. Her parents were able to come to Great Britain before the start of the war. In 1945 she began teaching at the boarding school from which she had just graduated. After attending college in England for two years, Dr. Walter left England in 1948 for the United States. There she pursued her studies and she received a B.A. degree from Hunter College in 1950 with a major in mathematics and minor in education. Following her graduation from Hunter she taught high school while continuing her education at New York University. She became a research assistant at NYU and received a Master’s degree in mathematics from that institution in 1954. Dr. Walter intermingled her studies with opportunities that would deepen her interests in problem posing and informal geometry. In the summers of 1952 and 1953 she studies at the Institute of Numerical Analysis at the University of California Los Angeles, headed by D. H. Lehmer, thanks to a Summer Student Scholarship from the National Bureau of Standards. During this time she met Olga Taussky-Todd who encouraged Walter to continue working on her Master’s degree thesis. Walter taught at Cornell University from 1954 to 1956 as a teaching fellow. In 1956 she joined the faculty at Simmons College as an assistant professor. During her 9 year tenure at Simmons Walter served a four year term as department head and initiated a major in mathematics. She was awarded an honorary degree by Simmons in 2010. In 1960, Professor Walter studied at Stanford University on an NSF Summer Faculty Award. At Stanford she was taught and influenced by Professor George Pólya. In the summers of 1962-67 and throughout the year in 1965-67, she worked on mathematics curriculum at the Elementary Science Study of the Education Development Center in Newton, Massachusetts. Walter left Simmons in 1965 to continue her (up till then part time) work on her doctorate at the Harvard Graduate School of Education (HGSE), which she completed in 1967. Upon completion of her Ed.D., Dr. Walter was appointed assistant professor to teach prospective elementary and high school teachers in the HGSE Master of Arts in Teaching program. At Harvard, Walter started a long-time collaboration with colleague Stephen Brown. They created a course that focused on posing and solving problems. Their joint work resulted in numerous journal publications and the book The Art of Problem Posing, first published in 1983 and currently in its 3rd Edition. She was the founding member of the still active Boston Area Math Specialists (BAMS), which runs regular workshops for elementary school specialists. In 2003, Dr. Walter was elected to the Massachusetts Hall of Fame for Mathematics Educators. Walter was a math consultant to several projects, including the venture that became Sesame Street. Walter authored a teacher’s guide for a unit in informal geometry called Boxes, Squares, and Other Things, which was published in 1970 by the National Council of Teachers of Mathematics. Dr. Walter wrote several books for young children that make use of a mirror for exploration. She also wrote The Mirror Puzzle Book for older children and adults ; it is described on amazon.com as “a puzzle book with no words.” She received Honorable Mention for her children’s books in the Annual New York Academy of Science Book Awards in 1973 and 1986. After the HGSE Master of Arts in Teaching program was eliminated, Dr. Walter had several short-term appointments: at Dalhousie University in Halifax, Nova Scotia, in Israel as a UNESCO consultant, at SUNY Buffalo as an assistant professor, and at Children’s Hospital in Boston as a research associate. In 1977, Dr. Walter began teaching in the Department of Mathematics at the University of Oregon in Eugene, Oregon. She taught many prospective teachers during her tenure at Oregon. She retired in 1993 as a Professor Emerita of Mathematics. In 2011 Professor Walter donated her collection of photographs of mathematicians to the Archives of American Mathematics. The Marion Walter Photograph Collection consists of 70 photographic prints, negatives, and slides and includes such figures as Olga Taussky-Todd, John Todd, George Pólya, Paul Erdöós, D. H. Lehmer, Ernst Straus, and many other distinguished mathematicians. Dr. Walter took most of the photographs between 1952 and 1954.